Earlier this week, Universal Orlando announced that they will be expanding their Simpson’s area of the park, adding an entire Springfield area to the park complete with iconic landmarks, restaurants and shops from the long running TV show(click here for that announcement). While construction has been going since the beginning of this year, the area is starting to resemble the show as signs and facades are going up all over the area. We take a look at all the construction in Springfield, as well as construction happening all over the rest of the park. 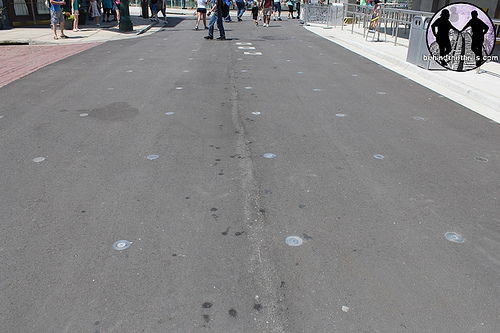 Since the announcement of the new Simpsons expansion, the area has really started to spring to life. The building facades have been visible for quite some time now, however, until recently, you however, exactly what they were was still a mystery. 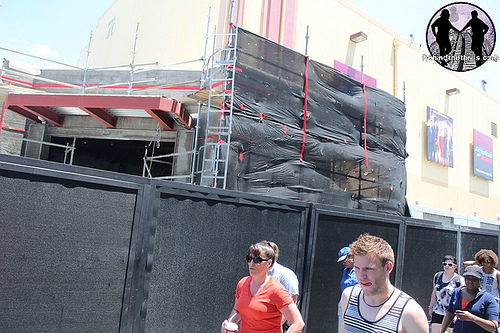 Sometime this week, Universal started installing signage for most of the buildings, such as the one pictured above. 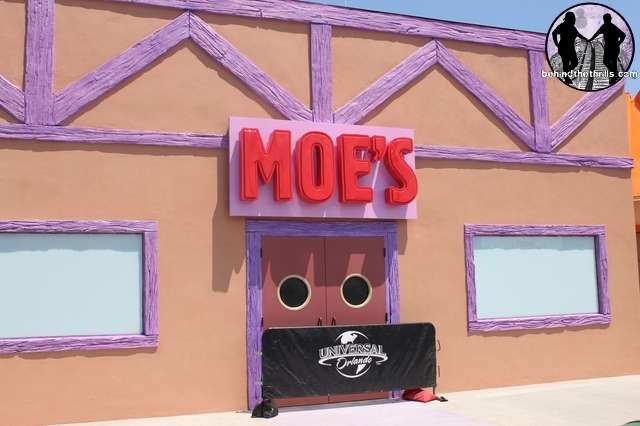 Signs have popped up for Moe’s, Krustyland, The Android’s Dungeon, The Frying Dutchman, and Cletus’ Chicken Shack. Across the path, work has begun on yet another new building. From what we’ve been told, this will be the actual home of the Simpsons and it will be the all new meet and greet area. The new meet and greet will be home to not only the Simpsons but also to the all new characters, Krusty the Clown and Sideshow Bob..both featured quite prominently in the Simpsons Ride. This is still a rumor at this point, so until it’s officially announced, take it with a grain of salt. 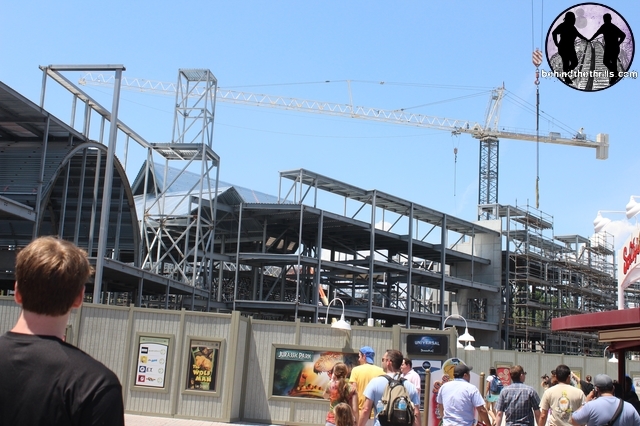 Across the lagoon, the Harry Potter London Expansion continues to rise and take shape. At this point, there is still a lot of internal structure work going on. The structures of the buildings along the water front look like they could be turned into gift shops based on their size. 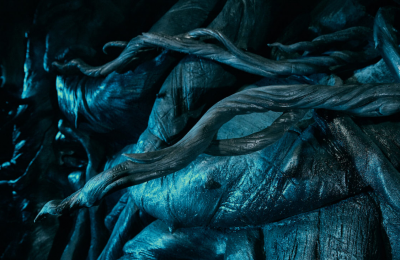 If that holds true, the gift shops will be similar in size to the gift shops that already exist within the Wizarding World of Harry Potter. 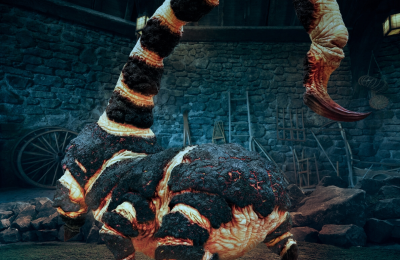 Universal Orlando launched their Screen Play application for Android and iPhone devices earlier this year, and they seem to really be taking off with it. 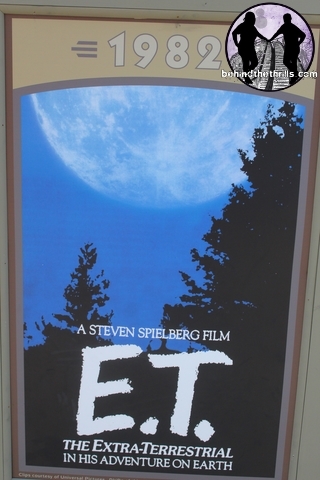 Along construction walls in the park,the regular posters have been replaced with those with a screenplay logo. 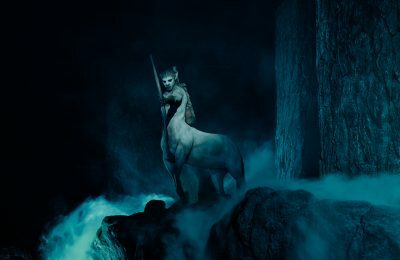 You can scan the posters with the app, making the larger posters come to life and the smaller posters will give you a movie trivia question related to that movie, allowing you to earn points and unlock achievements. 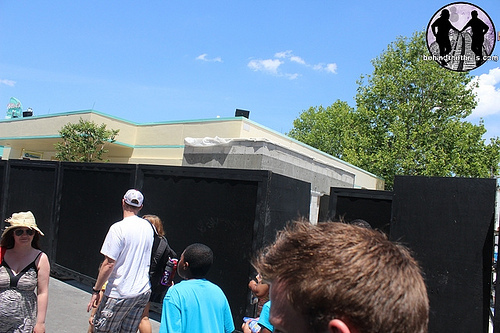 The all new Transformer’s the Ride is still just under a month from a grand opening, but rumors of a soft opening have been flying around like Starscream chasing Autobots. No soft opening has happened…yet…and it’s not clear whether one will happen. Crews are still working hard on small details to get ready for the grand opening, such as extending the sure to be full queue area. 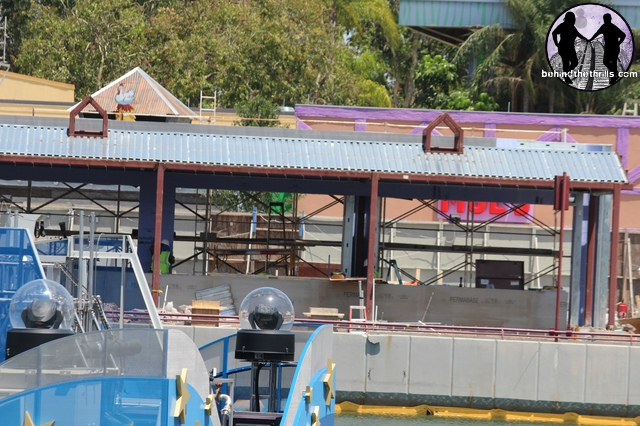 Also near Mel’s Diner two new structures have popped up. We’ve been told they will be for a Meet and Greet and a stand that sells Energon. Energon is creamy orange flavor drink that is said to be delicious. Energon is also the source of power for the Transformers…so who knows what affects it will have on humans when ingested. In the Universal Studios Store, there is a bit of construction going on. We’re sure these are just normal renovations to improve the store, but the entire back half of the store is blocked off with black curtains that stretch from one end of the store to the other. 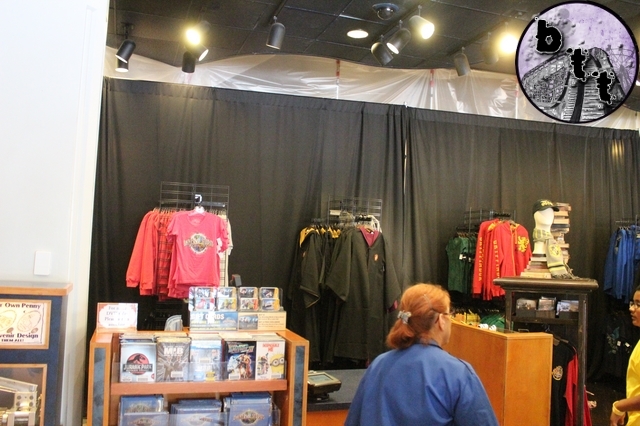 While it’s making the store a little more crowded, the renovations have not taken any merchandise away. In fact, despite the construction, more items have been added. In fact, Universal Orlando has rolled out a selection of merchandise that has been seen a little bit before: Mini Uni’s. The Mini Uni’s made their debut at Halloween Horror nights, and have since been used for Mardi Gras, and even Grad Bash. While they looked as if they were going to be a limited time item, there is a whole new line up of characters that recently rolled out. 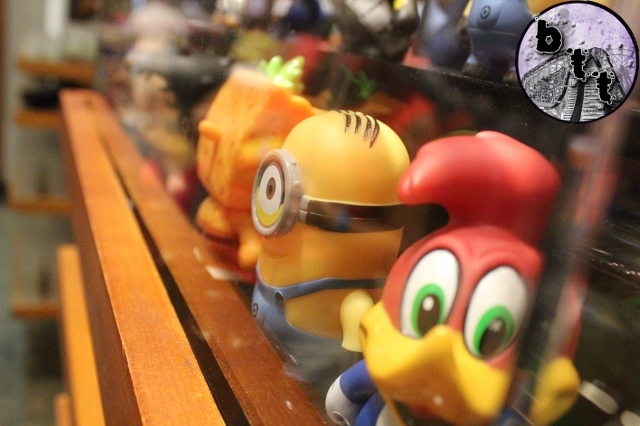 The line up features some of the lovable characters featured throughout the park, like Minions, Woody Wood Pecker, Sponge Bob Square Pants, ET, and more. Check out our full gallery of construction photos from yesterday in the slideshow below.